Leaders of the Eastern Church and the Western Church, representing billions of people worldwide, spoke with one voice this month about the moral urgency of confronting the climate crisis. 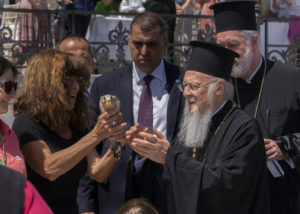 “A civilization is defined and judged by our respect for the dignity of humanity and the integrity of nature,” declared the head of the Orthodox Church, His All-Holiness Ecumenical Patriarch Bartholomew, in his keynote address for a three-day international symposium held in Greece. 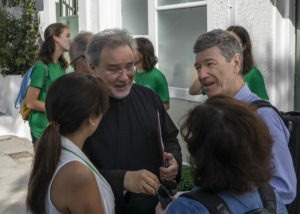 “Toward a Green Attica: Preserving the Planet and Protecting Its People” was the ninth international, inter-disciplinary, and inter-religious symposium that Patriarch Bartholomew has convened since 1991 to highlight the spiritual basis of ecological care and to strengthen collaboration across disciplines in our quest to build a just and habitable world. One of the most powerful, disturbing and illuminating lectures was given by Jeffrey Sachs, a world-renowned professor of economics and director of the Earth Institute at Columbia University. Sachs gave a one-hour overview of the history of economics that included a blistering critique of corporate capitalism and its veneration of greed, by which “Nature is utterly sacrificed for profit.” (A professional videographer recorded his speech, but until that video becomes available, you can watch a more basic recording here). Speaking of hope – Christiana Figueres, Executive Secretary of the United Nations Framework Convention on Climate Change (UNFCCC) from 2010-2016, gave one of the most impassioned appeals to active hope that I’ve ever heard. 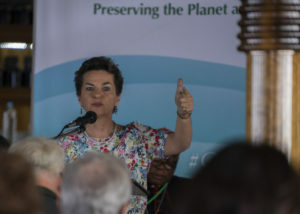 Figueres was a key player in the successful delivery of the Paris Climate Accord, an agreement that she deemed “fundamentally necessary” yet also “insufficient.” Figueres is a small, vigorous woman; her concentrated focus and fierce tenacity reminded me of a diminutive songbird with the astonishing capacity to migrate thousands of miles. Like the Rabbi, she, too, spoke of kairos, which she defined – citing Patriarch Bartholomew – as “the intersection of conviction and commitment.” In response to the urgent question, “What can we do?” she exhorted everyone: 1) to eradicate meat from our diets; 2) to be careful in our methods of transportation; 3) if we live in a democracy, to vote responsibly (to do otherwise is “collusion with a crime against humanity”); and 4) to leverage the power of capital by divesting from fossil fuel companies and investing in clean renewables. Figueres went further: she challenged communities of faith to “strengthen the arc of faith” – that is, to “inject confidence” in the process of transformation that has started and that must accelerate. After all, limiting global average temperatures to a 1.5º rise – the aspirational goal of the Paris Climate Accord – gives only a 66% guarantee of saving small island states. How many of us would board an airplane that had only a 66% chance of landing safely? She also challenged faith communities to “expand the arc of love,” so that no one is excluded. Both Jeffrey Sachs and Cardinal Turkson left the symposium early to travel to Rome. Pope Francis had taken the unprecedented step of inviting the world’s top fossil fuel executives – including the chairman of Exxon Mobil, the chief executive of the Italian energy giant Eni, and the chief executive of BP – along with money managers of major financial institutions, to meet with him in a two-day, closed-door conference at the Vatican. Sachs and Turkson joined the meeting to add their perspectives. Thus, in one extraordinary week, Christian Churches, both East and West, called for robust action to address climate disruption. What a blessing to be with you this morning! Thank you, Steve, for welcoming me back to this pulpit. I’m an Episcopal priest and long-time climate activist, and I have the world’s longest job title. I work as Missioner for Creation Care in the Episcopal Diocese of Western Massachusetts, and the United Church of Christ in Massachusetts. I am not a “missionary,” a word that’s often associated with trying to convert someone, but a “missioner,” which means someone who has been sent out on a mission, someone who has been sent out to serve God beyond the boundaries of a building. As Missioner for Creation Care, I travel in and beyond Massachusetts, preaching and speaking and leading retreats about the sacredness of God’s Creation and our call to become faithful stewards of God’s good Earth, particularly our call to address climate change. The God whom we meet so intimately in our depths is the same God who sends us out into the world to be healers and justice-seekers. My Website is RevivingCreation.org, where you can read articles and sign up for blog posts. My sermon boils down to three words: Keep the faith. That’s the phrase I often find myself saying to friends as we prepare to go our separate ways: Keep the faith. Other people have other favorite go-to phrases when they say goodbye. I remember Walter Cronkite signing off at the end of every nightly newscast: “That’s the way it is.” Before him there was Edward R. Murrow, who ended his radio and TV broadcasts with the words, “Good night, and good luck.” And as long as we’re on the subject of television, let’s not forget Dr. Spock from Star Trek, with his farewell blessing, “Live long and prosper.” I like all these expressions, but what I want to say, what I want to hear, is “Keep the faith.” We live in a precarious time, a time of turmoil when for all kinds of reasons many of us feel rattled and anxious, and brace ourselves for the next bit of bad news. So how glad I am that today, on the Second Sunday in Lent, we are invited to remember Abraham, our brother in the faith, our father in the faith, “the father of all of us,” as St. Paul puts it in his Letter to the Romans (Romans 4:16). When the story begins, Abraham is the archetype of someone stuck in a hopeless place, a place without faith. He is ninety-nine years old, for heaven’s sake, his body “already as good as dead,” according to St. Paul (Romans 4:19). He has no children by his wife, Sarah, who is no spring chicken, either. The data would suggest that he has reached a dead end. This man who wished for progeny for so long is all washed up; he’s at the end of his rope; his future is barren; the door has closed. But then he has an encounter with God that changes everything. We don’t hear the details of that encounter in today’s reading, though in another passage from Genesis it seems that Abraham’s experience took place at night, in the desert, under the stars (Genesis 15:5). Abraham encounters a God of life, a creative God with the power to make all things new, a God, says St. Paul, “who gives life to the dead and calls into existence the things that do not exist” (Romans 4:17). This wild and life-giving God, a God of justice and mercy, makes a covenant with Abraham, an unshakable bond, and promises him offspring, and a good land, and a future. None of those promises are visible yet, none of them has yet come to be, but Abraham’s faith awakens. It comes alive: he puts his faith in God. He trusts in God’s presence; he trusts in God’s power. He casts his lot with a God of infinite love and creativity, a God who has the power to restore and make whole. And in response to God’s call, Abraham sets out in faith. I want to emphasize that last point: he sets out. He walks. Today’s first reading makes it clear that faith is active, not passive: faith is practiced and made manifest in action. What does God say to Abraham? “I am God Almighty; walk before me, and be blameless.” Walk – don’t stand still, don’t get passive, don’t stay stuck and hopeless. Don’t wait for someone else to do something. Get going. Get moving. Take action. And don’t walk alone. “Walk before me,” says Yahweh, “and be blameless.” It is if God were an unseen presence and power that is always behind us, as if our job were to clear the way for divine love to move through us, freely and fully, like a river that flows through us and out into the world, so that all people and all beings can be blessed and healed and reconciled. Our task in the course of a day is to stay in conscious contact with God, so that as far as possible we are walking before God, not walking alone, not being driven by our ego or by our anxiety. Activists usually depend on people power, but spiritual activists – people who walk in faith – depend on God-power. It is God who energizes and emboldens us, God who gives us power to do more than we can ask or imagine. We live in a time that cries out for the imagination, determination, and heart of people of faith. The web of life is unraveling before our eyes. Great populations of creatures – even entire species – are rapidly disappearing from Earth. Scientists tell us that a mass extinction event is now underway – what they’re calling a “biological annihilation.” In addition to species extinction, we also face a changing climate. Because of the relentless burning of fossil fuels, month after month our planet is breaking records for heat. As Bill McKibben wrote, “Our old familiar globe is suddenly melting, drying, acidifying, flooding, and burning in ways that no human has ever seen.” 1 To cite just one example of how burning fossil fuels is affecting our planet: a recent study examined all the major research on oxygen loss in the ocean and concluded that over the past fifty years the amount of water in the open ocean that is without oxygen has more than quadrupled. As one headline puts it, the ocean is losing its breath. To put it another way, the ocean is suffocating. Lest we imagine that land creatures will not be affected, one scientist points out that about half of the oxygen on Earth comes from the ocean. A professor of marine science who reviewed the study commented that the need for action was best summarized by the motto of the American Lung Association: “If you can’t breathe, nothing else matters.” I suppose that’s one reason I’m a climate activist: I like to breathe. Climate change is not one of 26 different causes that we care about, but a cause that affects everything we cherish. If you care about the poor, you care about climate; if you care about immigration and refugees, you care about climate; if you care about public health, you care about climate; if you care about human rights, you care about climate; if you care about loving God and your neighbor, you care about climate. Climate justice is not an issue for a special interest group. If you like to breathe, if you like to eat, if you’d like to leave your children a world they can live in, you care about climate. To heal God’s Creation, there is a great deal that we, as individuals, can do. Maybe we can plant a tree. Save a tree. Recycle more. Drive less. Eat local, eat organic, eat less meat and move to a plant-based diet. Maybe we can support local land trusts and non-profits focused on conservation. We can fly less – and, if we must fly, buy carbon offsets. Maybe we can afford solar panels and move toward a carbon-neutral home. If we have investments, we can divest from fossil fuels, and if we’re college graduates, we can urge our alma mater to divest. Individual changes make a difference, but because of the scope and speed of the climate crisis, we need more than individual action – we need systemic change. To do that, we will have to confront the powers that be, especially when multinational corporations and members of our own government seem intent on desecrating every last inch of God’s Creation, pillaging every last natural resource, destroying every last habitat, and abandoning every last regulation, rule, and treaty that preserve clean air and water and maintain the stability of our global climate. Under the circumstances, I wonder at what point the practice of carrying out acts of civil disobedience will become as normative for faithful Christians as the practice of prayer.2 We will also have to confront versions of Christianity that contend that God has given us license to pillage and destroy the natural world, as if everything on God’s green Earth were placed here solely for the pleasure and benefit of a single species, Homo sapiens, or at least its privileged elite. Scott Pruitt, head of the Environmental Protection Agency, revealed this week, in an interview with the Christian Broadcasting Network, that he believes that the Bible gives human beings the (quote-unquote) “responsibility” to “harvest” natural resources like coal and oil, although we know full well that burning these fuels is wrecking the planet entrusted to our care. As Mother Jones reports in its cover profile of Pruitt in its March/April issue, the EPA chief’s beliefs are rooted in a version of Christianity that is the “polar opposite from that of other religious leaders, including Pope Francis, who interpret stewardship as the responsibility humans have to protect God’s creation.” When corporate and political powers set us on a path of disaster – when they remain hell-bent on locating, extracting, and burning as much coal, gas and oil as they possibly can, never mind the potentially catastrophic effects of what they’re doing – the time has come for us to unleash our faith, to make it visible and make it bold. I give thanks for the story of God’s covenant with Abraham, our father in the faith. It reminds me that in perilous times, God calls forth a people who put their trust in a power greater than themselves; a people who start walking even if they have no map and must create the map as they go; a people with the God-given imagination to envision a future in which the land will prosper and our offspring will thrive; a people who trust in the creative, liberating power of the God who is within them and among them, beyond them and behind them, making a way where there is no way, giving life to the dead, and calling into existence the things that do not exist. Thank you for whatever you are doing – or will do – to re-weave the web of life and to love God and all our neighbors, human and other-than-human. You know, we are all missioners for Creation care. Every who shares the faith of Abraham and Sarah, everyone who follows Jesus – every one of us here is a missioner for Creation care. Thank you for being on the journey with me. Keep the faith. 1. Bill McKibben, Eaarth: Making a Life on a Tough New Planet, New York: Henry Holt and Company, Times Book, 2010, p. xiii and book jacket. Italics in original. 2. I credit the Rev. Dr. Jim Antal with issuing this challenge, which he explores in his new book, Climate Church, Climate World (Rowman & Littlefield, 2018). Such a partnership has enormous potential in this perilous time. In fact, such a partnership may be not just desirable, but even essential. Given the massive disruption of our global climate that is now underway, we need to hear from scientists, who have made it abundantly clear that continuing to burn fossil fuels will lead in a very short time to climate catastrophe. And we also need to hear from spiritual and religious leaders, who can give us the inspiration, motivation, and moral courage to change course and to create a more just and life-sustaining society. 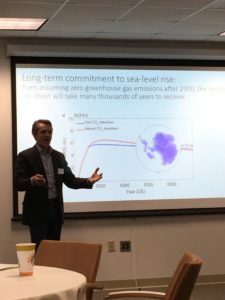 Professor Robert DeConto of University of Massachusetts, Amherst, gave a brief, stark presentation of his research on the Antarctica ice sheet, noting that business as usual would result in a one meter global rise in sea levels by 2100 that would affect 152 million people worldwide – just from the melting of Antarctica’s ice. Lest those numbers sound abstract, he brought his message home with a slide depicting how much of Boston would be underwater. I was invited to speak about the current state of religious climate action in Massachusetts, and my remarks are posted below. Some of the other faith-based speakers included the Rev. Mariama White-Hammond of Bethel AME Church, who, in a talk entitled “The Cry of the Poor,” spoke eloquently about climate justice, urging us to grapple with the contradiction that the people most harmed by climate change are not the people who make policy decisions. Professor Moomaw suggested: What if this second notice about the ways that human activity is unraveling the web of life were handed out in every congregation and cited in the newsletters of every faith community? The Rev. Fred Small, Minister for Climate Justice at Arlington Street Church, Boston, stood up to say, “This is a historic gathering. If it isn’t a historic gathering, we will have failed.” He urged us to take to heart Pope Francis’ admonition in Laudato Si that we must become politically engaged and strategic. To quote the Pope’s encyclical: “Unless citizens control political power – national, regional and municipal – it will not be possible to control damage to the environment.” (179). Rev. Fred went on to say, “My prayer and my entreaty to the Archdiocese is to bring the same passion and priority to climate justice as to any pro-life effort heretofore — because there is nothing more pro-life than protecting and preserving Creation, the environment on which all human life depends.” If we don’t do this, he added, the cost would be enormous in fire, famine, flood, and refugees. Looking back on these intensive two days of discussion and our plans for next steps, I live in hope that something new is indeed being born right here in Massachusetts as people of science and people of faith come together to unite head and heart and to work together to protect our common home. I am blessed to be here. Thank you, Cardinal O’Malley, for convening us. To you and to everyone here I bring greetings from Bishop Doug Fisher of the Episcopal Diocese of Western Massachusetts, whom I am representing. I’ve been asked to speak briefly about the current state of religious climate action in Massachusetts, and I’ll start with a word about myself. I was ordained in June 1988, the same month that NASA climate scientist James Hanson testified to the US Senate that scientists were increasingly concerned about the effects of burning fossil fuel and what at that point they were calling “the greenhouse effect.” Concern about climate change was placed on my heart at the very beginning of my ordained ministry, at its root, and in the years since then, I have tried to understand our spiritual and moral responsibility as human beings – as religious leaders – in a time of such great peril. In 2014 I finally left parish ministry to give the climate crisis my full attention. I now serve as Missioner for Creation Care in the Episcopal Diocese of Western Mass., and in the United Church of Christ across Massachusetts. 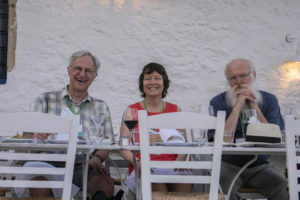 To me this unusual ecumenical position is a sign of how the climate crisis impels us to come together across faith traditions to organize and mobilize. Just from looking around, I can say that the interfaith climate justice movement in Mass. is alive and well. With people in this room (and beyond) I’ve preached about climate change and led workshops for clergy on how to preach about climate. With people in this room I’ve led retreats and written pastoral letters and ecumenical statements. With people in this room I’ve pushed for divestment from fossil fuels, lobbied for carbon pricing, marched for climate justice, held prayer vigils, and been arrested for acts of non-violent civil disobedience to keep fossil fuels in the ground. I am heartened by what I see as an upsurge in awareness and concern here in the Commonwealth among people of faith and good will, and a growing desire to connect the cry of the Earth and the cry of the poor. I am thrilled that The Poor People’s Campaign is taking shape and linking justice of every kind – social, racial, economic and ecological. Meanwhile, I want you to know that a group of people of many faiths is organizing a climate witness that will take place in Boston on Monday in Holy Week, March 26, a few days before Passover. We’re calling it Exodus from Fossil Fuel. We will hold an interfaith ceremony at the State House, appeal to the Governor to stop the expansion of fossil fuel infrastructure, and then march in procession to the Back Bay, where a new pipeline project is slated to power luxury high-rises with fracked gas. There we plan to witness to our vision of a beloved community, and to our intention to build a just and livable future for our planet and all its inhabitants. I expect that young people will join us, because I know they are looking for moral leadership on climate. I invite you to join us, too. The movement is growing, but what we’re missing is an effective, strategic, and well-organized network that mobilizes faith communities from top to bottom, rouses the general public, and becomes an unstoppable force on the political scene. Some of us recently tried and failed to create such a network. 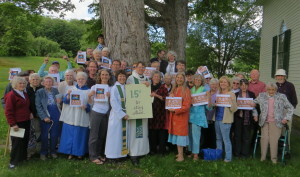 Massachusetts Interfaith Coalition for Climate Action (or MAICCA, for short) came into being in 2015, inspired by the release of Laudato Si. It had a good two-year run. MAICCA did many wonderful things, such as making it easy for congregations to become politically engaged, organizing legislative action days at the State House, setting up waves of meetings with local legislators, and taking a leadership role in the huge climate march and rally that was held in Boston in December 2015. But MAICCA ran into trouble – for one thing, we never worked out our organization or a sustainable strategy. The time is ripe for a new initiative. 1) I hope that top leaders of faith communities will make it crystal clear that addressing the climate crisis is central to our moral and spiritual concern. It’s not one of 26 different causes that we care about, but a cause that affects everything we cherish. I hope that top faith leaders will convey to their congregations that if you care about the poor, you care about climate; if you care about immigration and refugees, you care about climate; if you care about public health, you care about climate; if you care about human rights, you care about climate; if you care about loving God and your neighbor, you care about climate. The climate is not an issue for a special interest group. If you like to breathe, if you like to eat, if you’d like to leave your children a world they can live in, you care about climate. 2) I hope that faith communities will get organized within our selves and across traditions so that we become scientifically informed, spiritually grounded, and politically effective, enabling us to speak with one voice about the sacredness of God’s Creation and the moral imperative to protect it. 3) I hope that faith communities will draw from our deep spiritual wisdom as we confront the climate crisis. We know that the massive West Antarctica ice shelves are collapsing and sliding into the sea in a process that some scientists call “unstoppable.” Yet we also know that the love of God is unstoppable. With that love in our hearts and in our midst, who knows what we will be able to accomplish? Last Tuesday, Americans voted into office a Presidential candidate who has embraced fossil fuels, called climate change a hoax, and vowed to withdraw from the Paris agreement. 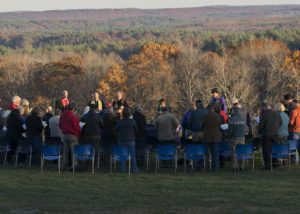 Yesterday, five days later, Christians from across Massachusetts gathered on a hillside to reaffirm our dedication to restoring God’s creation. 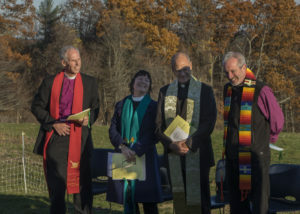 Led by five of the top Protestant and Roman Catholic leaders in our Commonwealth, we prayed and sang under an open sky as the afternoon sun cast long shadows across the woodlands and fields. 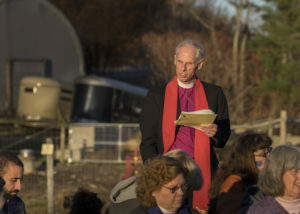 Heifer Farm in central Massachusetts is the perfect spot for an outdoor prayer service, not only because the location is inherently beautiful, but also because the mission of Heifer International – to end poverty and hunger through sustainable community development – so closely aligns with our mission as Christians to respond to the cry of the Earth and the cry of the poor. After listening to readings from the Book of Genesis, Meister Eckhart, and Wendell Berry, and after confessing our alienation from the Earth and receiving an assurance of God’s pardon, we listened as Christina Leano, a leader in the Global Catholic Climate Movement, read “A Christian prayer in union with creation,” from Pope Francis’ encyclical, Laudato Si: On Care for Our Common Home. Then it was time to renew our individual commitment to the Earth and to make our own personal pledge. I stepped to the microphone. Here is what I said. These words of Pope Francis express our deep yearning, as people of faith, to safeguard the world that God entrusted to our care. We didn’t choose the date for this prayer service because it was the first Sunday after a long and painful election process. We chose it because it happened to be the date when top Christian leaders from across Massachusetts were available to come. But I can’t think of a better day to reaffirm our steadfast commitment as Christians to be reconcilers and justice-seekers, people who are willing to take action, just as Noah did, to protect life on this planet. I know that many of us feel tired and shaken to the bone. 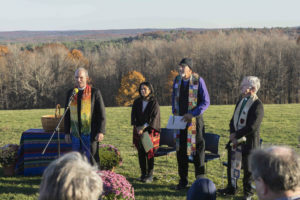 Yet here we are – sturdy, resilient souls sitting outside on a hillside on a November afternoon, in the company of five leaders of the Churches in Massachusetts: Bishop Doug Fisher (Episcopal Diocese of Western Mass. ); Bishop Alan Gates (Episcopal Diocese of Mass. ); Jim Antal (Conference Minister and President, Mass. Conference, United Church of Christ); Bishop Jim Hazelwood (New England Synod, Evangelical Lutheran Church in America); and Fr. 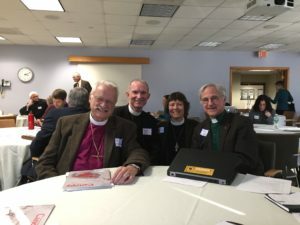 Richard Reidy (Vicar General, Catholic Diocese of Worcester), who is representing Bishop Robert McManus, away in Baltimore for the annual Fall meeting of the United States Conference of Catholic Bishops. We represent different branches of the Jesus Movement, but we are united in a single Christian mission. We are here to say that we know who we are: people made in the image and likeness of God; people sent out into the world to bear witness to the love of God in Jesus Christ. We are not willing to settle for a world ruined by catastrophic climate change. We are not willing to stand by and let the seas rise and let the ice caps melt and let people’s homes and livelihoods be destroyed by extreme storms. We are not willing to keep burning fossil fuels at present rates, to let “business as usual” run its course and to leave a ruined world to our children. We are here because we know we live in precarious times. The word “precarious” derives from the word for “prayer,” so first and foremost we are here to pray, to feel God’s presence and to seek God’s guidance. After the flood, God made a covenant with every living creature for all time, and put a rainbow in the sky as a sign of God’s unfailing love for all creation. When we act and advocate in service of God’s creation – when we hold in our hearts the future generations who are counting on us to leave them a habitable world – we do so in the presence and power of a divine love that will never let us go. Today we have an opportunity to respond to God’s covenant. In a moment I will invite each of us to make a pledge, to make a commitment to stand up and stand together to protect God’s creation and to address climate change. We’ve created a pledge card to help you organize your thoughts about what you might feel led to do. After the homily, pledge cards with green ribbons were distributed to the congregation. Four religious leaders rose from their seats and took a stand at each corner of the congregation to express their support. Making promises is not easy when you intend to keep them. I began the ceremony by reading the opening statement of the pledge: We are the Earth…I am the Earth…What I do matters…This is what I am called to commit to now. I pledge to Pray… I will pray for the earth, for humanity, and for guidance in my own life and practice so that I live more gently on the earth. In particular, I pledge to…. Then followed a period of silence, as members of the congregation reflected on their own commitment to pray for the Earth. Here he pledged to read a book about the climate crisis – and there are many fine options to choose from, such as Bill McKibben’s Eaarth and Naomi Klein’s This Changes Everything. In the silence that followed, the congregation bent over their pledge cards, jotting down their own commitments to learn. He commented that he drives 35,000 miles in the course of a year, and he pledged to get a hybrid car. He also pledged to encourage and support the churches in our diocese to go green. Again, in the silence, we reflected on the actions that we felt led to take. In the ensuing silence, we made our own personal commitment to advocacy. The full pledge card (which includes ideas for different ways to Pray, Learn, Act, and Advocate) can be viewed and downloaded here. • “purposing” practices that tap into the core values we want to live by. Our task is to practice these skills and to build resilient communities – sturdy networks of relationship, communication, and trust that can withstand trauma and adversity. It seems to me that yesterday’s prayer service, We Are The Earth, bears all the hallmarks of encouraging emotional and spiritual resilience: we practiced the presence of God as we sang and prayed, calming our minds and opening our hearts; we tapped into our deep purpose as Christians, as we made our pledge commitments to follow a God of love; and we strengthened our bonds of community through our laughter, hugs, and tears. Yes, we live in precarious times. That’s why we intend to keep praying, to take every action we can to restore our beloved human and Earth communities, and to do so in community, leaving no one out. Thank you for inviting me to speak. I am excited by what you’re up to as a coalition, and very interested to see what emerges from today’s meeting. I am not a “missionary,” a term that can evoke imperialist, colonial-era associations of forcibly converting someone to a religion, but rather a “missioner”: someone who is sent out on a mission, serving a purpose greater than herself, out of the box, outside the boundaries of a building. And I’m a missioner for “Creation care,” a term, it turns out, that some people confuse with “creationism,” the belief that the universe originated from acts of God that are literally described in the Bible. Being a missioner for “Creation care” (not creationism) means that I’m trying to protect the beautiful world that God created. My Website is RevivingCreation.org, where you can find blog posts, sermons, articles, and more – including an article on how to start a green team, and an article on the roles that communities of faith can play in a time of climate crisis. My job is like a swinging door: on the one hand, I preach, speak and lead retreats for people of faith, saying that we need to place the climate crisis at the center of our moral and spiritual concern and we need to take action. Then I turn, and I speak to activists who may have no particular faith tradition. I thank them for engaging in the struggle to protect the web of life, which is such urgent and difficult work. I tell them that the only way to keep going, without burning out or going off the rails, is to draw from inner resources of spiritual wisdom, from spiritual practices, and ideally from the support of a spiritual community. Today the swinging door is an open door: people of faith and climate justice activists are here together in one place! How sweet it is! I hope we can break down (or at least soften) the false split of people into two camps: “spiritual” people (people who pray, meditate, and take time to contemplate beauty of the world; people who give thanks and who attend to their inner lives) and “active” people (people on the front lines who are serving, helping, organizing, advocating). I hope we can keep working to heal that false split, because right now we need people who can do both: people who can tap into their deep inner wisdom and who can also step out to take bold, creative action on behalf of life on this planet. More than ever we need wise people, bold people, dedicated people, because we’re in the midst of an emergency. The house is on fire. Through burning fossil fuels like coal, gas, and oil, in 200 years – just a blink in geologic time – we’ve pumped so much heat-trapping CO2 and other greenhouse gases into the air that atmospheric levels of CO2 are higher than they’ve been for millions of years. In a TED talk a few years ago, climate scientist James Hanson explained that the added energy (or heat) that we’re pouring into the atmosphere is equivalent “to exploding 400,000 Hiroshima atomic bombs per day, 365 days per year. That’s how much extra energy Earth is gaining each day.” Not surprisingly, this is having a profound effect on planet. In his book Eaarth, Bill McKibben writes: “Our old familiar globe is suddenly melting, drying, acidifying, flooding, and burning in ways that no human has ever seen.” Scientists tell us with increasing alarm that unless we change course fast, we’re on a fast track to catastrophic, runaway climate change that would render the world very difficult to inhabit, perhaps in the lifetime of our children. Last year Pope Francis released a powerful encyclical, Laudato Si’, which opened up space for a new and more urgent conversation about the radical change of course that human societies must take if we wish to safeguard life on this planet and to build a just, sustainable society. If you haven’t yet read Laudato Si, I hope you will. It’s short, and you can download it from the Internet for free. I don’t agree with everything in it, but it draws from the best of Judaeo-Christian tradition, it speaks to people of all faiths, and it gained ringing endorsements from religious leaders around the world. Evangelical leaders expressed strong support; over 400 rabbis signed a Rabbinic Letter on the Climate Crisis; Islamic leaders from 20 countries released the Islamic Declaration on Climate Change; and Anglican bishops issued a fresh call for action on climate justice. I’ve been a climate activist for many years, but I have never felt the rising tide of commitment and momentum that I now feel. I’m deeply thankful for that, even as I am keenly aware that we have a long struggle ahead. Every religion has issued some kind of statement about the moral and spiritual urgency of addressing the climate crisis – here is just one collection, Faith-based Statements on Climate Change, collected by Citizens Climate Lobby volunteers. Climate change is obviously a scientific issue, an economic issue, a political issue, but it is also a moral issue, a justice issue. The poorest nations and the poorest citizens in each nation are those most vulnerable to climate change, because of flooding, food shortages, and the loss of clean water. As we see in Flint, Michigan, and right here in Springfield, the front-line communities most affected by fossil fuel pollution are often low-income communities and communities of color. The poor are often the people least responsible for causing climate change, and the people least equipped to protect themselves from its effects. As the Pope’s encyclical makes crystal clear, healing the climate is closely connected with securing social justice, racial justice, environmental justice, and economic justice. We can see that very starkly in the struggle going on right now at Standing Rock in North Dakota, in the resistance to the Dakota Access pipeline. And climate change is about intergenerational justice, too, for right now we are stealing a habitable Earth from our children. So climate change is a justice issue. And it’s a spiritual issue, too. I titled these remarks “Climate change: An emergency of the heart,” because in the face of the climate crisis, it’s so easy to get emotionally overwhelmed, to go into panic mode and be flooded by anxiety, or to shut down entirely, go numb and not feel a thing, because we don’t know what to do with our fear and anger and grief. Another strategy to avoid our feelings is to get really busy. If I stay super busy, if I have an endless list of things to do, if I try to cram in more tasks in a day than any human beings could possibly accomplish, then I won’t have to feel the clench in my belly or the ache in my heart. Addictive behaviors are another “go-to” strategy. Don’t like what I’m feeling? Maybe it’s time to do some shopping, eat another cookie, have a smoke, have a drink – there are lots of ways to go numb and repress what’s going on inside. Yes, we are in a climate emergency. We’re also in an emergency of the heart. We need to learn to be “first responders” to ourselves and to each other. We need to be gentle with ourselves and with each other. We can’t think our way out of anxiety. So I will share three remedies, three spiritual practices for responding to the cry of the heart. I invite us to pray. I invite us to explore practices that quiet our minds, bring us into the present moment, and help us listen to our deepest wisdom. This could include practices of mindfulness, practices of gratefulness, practices of meditation and contemplative prayer. Practices like these help us to open to the deep inner wisdom that is always speaking in our hearts. Practices of prayer and meditation help us to listen to the inner voice of love. That’s a very different image of God than the one we may be used to. God is not “out there,” far away in the heavens. God is “in here,” closer than our next breath. I invite us to allow ourselves to grieve. We have lost so much, and there is more loss ahead. I invite us to let ourselves feel the pain so that we are able to move forward and to be fully alive. Until we allow ourselves to grieve, parts of ourselves will stay numb, even dead. 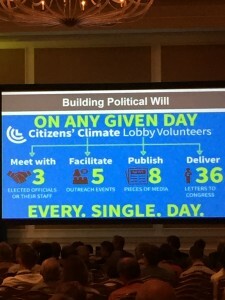 A couple of weeks ago I attended a climate summit in Washington, DC, and I happened to be seated beside the Executive Director of the US Climate Action Network. Our task at each table was to do a go-round and to name the top three things that need to be done in order to tackle climate change. The first suggestion from this activist was: Grieve. Let me add that there are two ways to grieve: one is to grieve alone, in a state of despair – the kind of grief that does not bring healing. The other way to grieve is to grieve within the embrace of love. If we believe in God, we do this when we pray our grief: we grieve in the presence of a loving God who embraces and shares in everything we feel. But whatever our religious beliefs, we can grieve with each other and we can hold each other with love. Finally, I invite us to discover who we really are. 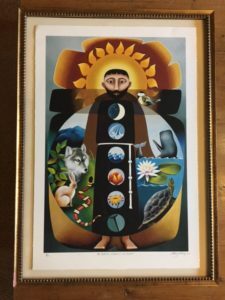 I brought in this icon of St. Francis, who is often called the patron saint of ecology. You can see that Francis didn’t think that that he was alone and that his identity stopped with his skin. He is interpenetrated by other creatures – by wolf, bird, turtle, and snake – and even by elements like wind and fire. He spoke of Brother Sun and Sister Moon. Francis’ daily prayer was “Who are you, God, and who am I?” Pray that prayer for a while and see what happens! Our identity does not stop with our skin! When we experience ourselves like that, as interpenetrated with all of life, then we know that when we take action to save life on earth, we do so in the company of the trees, of the earth and sky. When we stand up for life – when we get arrested in a protest against fossil fuels, when we divest, when we take whatever actions we’re called to take – the trees are thanking us. The animals are thanking us. We are not alone. The whole creation is offering its support. Thank you for the work you’re doing to re-weave the web of life. I may have the title, “Missioner for Creation Care,” but I only hold that title on your behalf. Each of you – everyone in this room, every single one of you – you too are missioners for Creation care. I am blessed to be with you this morning. Thank you, Molly, for inviting me. 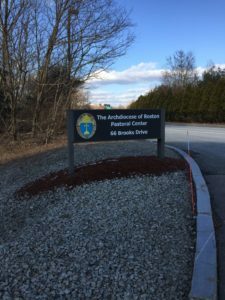 As some of you know, after a good 25 years in parish ministry I now work for the diocese as your Missioner for Creation Care, a job that recently expanded to include working for the United Church of Christ in Massachusetts. I travel from church to church, preaching the Gospel and speaking about our call as Christians to protect and heal God’s Creation. Just a few days ago, on Tuesday, October 4, the Feast Day of Francis of Assisi, our diocese launched its third annual Season of Creation, so here on the very first Sunday of Creation Season I’d like to say a few words about the sacredness of the world that God entrusted to our care. What’s been striking me lately is the power of nature to heal. Since August my husband and I have been living in an old farmhouse in the hills of Ashfield, not too far from Turner’s Falls. We’re building a house in Northampton that won’t be ready until sometime this spring, so between now and early March we have a rare opportunity to live closer to the natural world. In the mornings I’ve been walking outside to watch the mist as it floats above the pond. I’ve been breathing in the cool air as the sun rises, and studying the array of spider webs that sprang up overnight in the grasses. I’ve been listening to the occasional cry of a blue jay and watching the birches bend over the pond, dropping their yellow leaves one by one into still water. 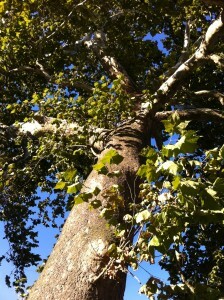 I know you know this for yourselves: when we immerse ourselves in trees and wind and birdsong, our minds grow quiet. Spending prayerful time outdoors confirms all those research studies that show what intuitively we already knew: conscious contact with the natural world can be healing. Our blood pressure returns to normal, our racy minds slow down, our breathing becomes deeper and more even, and our anxious worry and striving fall away. 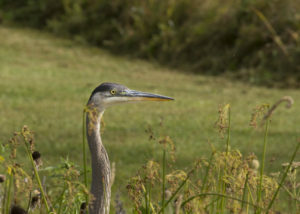 Being in nature can restore our capacity to see and hear, to connect and relate: we start to notice the multiple shades of green; we spot bugs and plants we’ve never observed before; we may even be graced by the visit of a blue heron that lands on a rock beside the pond and stands motionless for a time out of time, as if ready to dissolve into sunlight and shadow. Thanks to that contemplative gaze – to a long, loving look at the real – the barrier dissolves between us and the living world around us. The longer we look, the more clearly we understand that everything is connected, everything is alive with Spirit, everything is held together by a divine presence that sustains and upholds all things. Moment by moment God is giving God’s self to us in the natural world, and it becomes obvious that nature is not a machine; nature is not a commodity; nature is not just an object or “resource” for us to exploit, consume, and dominate – nature is a living mystery, a sacred, living web of life that reveals God’s glory. 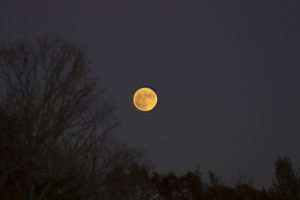 That’s the vision of Francis of Assisi, who spoke of Brother Sun and Sister Moon. That’s the vision of poets like Gerard Manley Hopkins, who wrote, “The world is charged with the grandeur of God.” That’s the vision of theologians like Martin Luther, who said, “God writes the Gospel, not in the Bible alone, but also on trees, and the flowers and the clouds and stars.” That’s the vision, I believe, of Jesus himself, a man who lived close to the Earth, whose ministry began by immersion in a river and who prayed and lived and walked countless miles outdoors. In his parables and stories, Jesus talked about God in terms of natural things: seeds and sparrows, lilies and sheep, rivers, wind, and rocks. Jesus was deeply aware of the sacredness of the natural world and it’s no wonder that in our sacraments we, too, make contact with simple earthy things, with bread and wine and water. We trust that God is in these things – that when we take in the consecrated bread and wine of the Eucharist, we take in God’s presence. Like the ten people in today’s Gospel story who suffer from leprosy, many of us could use some healing right around now. “Leprosy” comes in many forms. Maybe we are eaten up by malice or resentment, or gnawed by self-doubt and insecurity, or plagued by worry and stress. Heaven knows this year’s presidential campaign is keeping many of us by turns agitated, excited, appalled, and on edge. Yet God in God’s generosity is always pouring out God’s self to us at every moment and in every place, always ready to heal us, to restore us to sanity, and to make us whole. There is nowhere we can go that God is not, and it’s in nature that many us experience the divine touch afresh. When, in the midst of our agitation or anxiety, our grief or stress, we feel again our kinship with our Creator and with all created things, when we are caught up again in the healing flow of divine love that connects us to ourselves, to each other, and to everything that is, we experience a deep response. Like the tenth leper who turns back, “praising God with a loud voice” (Luke 17:15), we, too, want to fall on our knees and give thanks. We, too, want to prostrate ourselves, for we are filled with gratitude. Thank you, Jesus. And then comes that magnificent last line of the story, when Jesus says, “Get up and go on your way; your faith has made you well” (Luke 17:19). “Your faith has made you well”: all ten lepers were physically healed, but the one who gave God thanks experiences an even deeper, more complete level of healing and wholeness. He is spiritually alive, and well, and awake – perhaps on a path to enlightenment, for such is the power of the gratitude. “Get up and go on your way”: there is work to be done, says Jesus. Yes, stop to give thanks and praise, and then get up and go: you are healed, you are well, now go out into the world and join in my mission of healing, justice, and mercy. Just as God brings us healing, so does God call each of us to become healers, too. 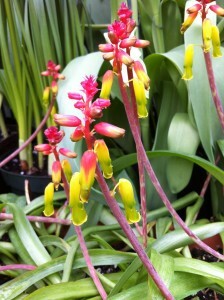 We know that we are living at a time when the natural world is under extraordinary stress. The web of life is unraveling before our eyes. We’re on the edge, or in the midst, of what some experts call the sixth major extinction event on this planet. And in just 200 years – a blink in geologic time – human beings have burned so much coal, gas, and oil and released so much heat-trapping carbon dioxide into the atmosphere that atmospheric levels of CO2 are higher than our species has ever experienced before. That extra CO2 is forcing the average global temperature to rise, and what’s so worrisome to scientists is that this process is happening very fast. Already oceans are heating and becoming more acidic; tundra is thawing; ice caps are melting; sea levels are rising; coral reefs are dying; massive droughts are spreading in some places and heavy rains intensifying in others. 2016 is the hottest year in history. This week we watched a massive hurricane, fueled by unusually warm seas, roar through the Caribbean and up the southeastern coast of the United States, killing hundreds of people and forcing millions more to evacuate. I hope you will join me in making a donation to Episcopal Relief & Development, which has set up a special fund for hurricane relief. Hurricane Matthew has been described (by May Boeve of 350.org) as “exactly the kind of stronger, wetter, more dangerous storm [that is] produced by an overheating planet” As we see in Haiti’s suffering, it is often the poorest people and poorest countries that are hit first and hardest by the effects of a changing climate. And according to the World Bank, unless we quickly rein in greenhouse gas emissions, climate change will drive 100 million people into extreme poverty – extreme poverty – in the next 15 years. We have only a short time in which to avert a level of climate disruption that would render the world ungovernable and possibly uninhabitable within the lifetimes of our children and our children’s children. When I look around, I see a planet in peril, but – thanks be to God – I also see person after person reaching deep into their souls and then standing up to join the struggle to re-weave the fabric of life and create a just and sustainable future. I see a wave of religious protest and activism rising up around the world, propelled in part by the release last year of Pope Francis’ Laudato Si’, which makes a powerful connection between the cry of the earth and the cry of the poor. I see people rising up for life, refusing to settle for a killing status quo, and proclaiming with one voice that climate change is a spiritual and moral issue that must be tackled without delay. Just think of all the signs we see of a new social order being born. We see people blocking the path of new fracked gas pipelines and being arrested for civil disobedience as they read aloud from Pope Francis’ encyclical. We see people lobbying for a fair price on carbon, so that we can build a clean green economy that provides decent jobs and improves public health. We see our own Episcopal Church deciding to divest from fossil fuels, since it makes no financial or moral sense to invest in companies that are ruining the planet. We see new coalitions being formed as people realize that the environmental crisis is closely connected with the social crises of poverty, income inequality, and racial injustice. We see unexpected alliances taking shape. 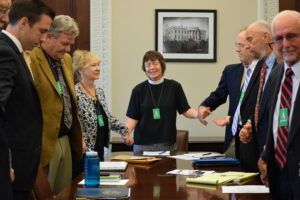 A few weeks ago I joined a group of religious leaders that met with the White House Council on Environmental Quality to press President Obama to take bolder action on climate. We ended the meeting in a powerful way: we stood up and joined hands around the table, and I prayed for the guidance of the Holy Spirit. But you don’t have to go to Washington, D.C., to join the climate movement. Right here in the Pioneer Valley we have an unusually strong grassroots group, Climate Action Now. If you sign up for the weekly newsletter or attend a meeting, you’ll be hooked into a vibrant local effort. After today’s service I’d be glad to share a handout of other actions we can take as Christians to become healers of the Earth. Along with so many others, we are fighting to keep fossil fuels in the ground and to accelerate a transition to clean, safe, renewable sources of energy like sun and wind that are accessible to all communities, including those that are low-income or historically under-served. As climate activist Bill McKibben has pointed out, “The fight for a just world is the same as the fight for a livable one.” The Church was made for a time like this – a time when God calls human beings to know that we belong to one Earth, that we form one human family, and that God entrusted the Earth and all its residents to our care. Like the ten lepers in today’s Gospel story, you and I experience God’s healing presence. We know that God has power to save. All the lepers had faith in Jesus and all of them were healed, but only one of them, the tenth, knew the joy of turning back to say thanks, and the joy of being sent out to bear witness to God’s power to heal. May that joy be ours as well. 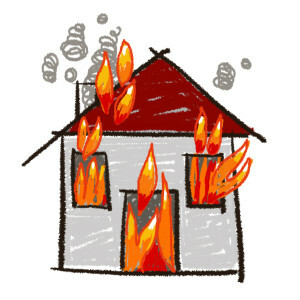 Imagine there is a fire in your house. What do you do? What do you think about? You do whatever you can to try to put out the fire or exit the house. You make a plan about how you can put out the fire, or how you can best exit the house. Your senses are heightened, you are focused like a laser, and you put your entire self into your actions. You enter emergency mode. These are the opening lines of a fascinating essay that every climate activist and every faith leader should read. 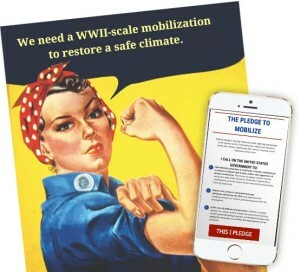 “Leading the Public into Emergency Mode: A New Strategy for the Climate Movement” recognizes that when we face an existential or moral crisis, we can pull back into paralyzed inaction or rush about in panicked, ineffective, chaotic action. But choosing between paralysis and panic is not our only option. Instead, we can enter a state of consciousness in which we become highly focused and purposeful, pour our resources into solving the crisis, and accomplish great feats. When we enter emergency mode, inertia or panic are replaced by focused, productive action toward a few critical goals. Non-essential functions are curtailed. Failure is not an option. In ordinary times, a country is governed in what Salamon wryly labels “normal political-paralysis mode.” We experience a lack of national leadership, and politics is “adversarial and incremental.” By contrast, when a country is in emergency mode, “bipartisanship and effective leadership are the norm.” People work together because they face a shared and urgent threat. 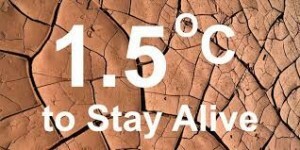 Salamon accurately calls the climate crisis “an unprecedented emergency.” She writes: “Humanity is careening towards the deaths of billions of people, millions of species, and the collapse of organized civilization.” Her article and her organization, The Climate Mobilization, are devoted to developing strategies to mobilize an emergency response. Although I don’t agree with all her policy recommendations, I believe that her basic framing of the challenge is just right. Most faith communities do not recognize the climate crisis and are not in emergency mode. Yet when faith communities enter this heightened state of awareness about our planetary emergency, we have significant gifts to offer. People who are secretly worried about climate change often don’t take action because they feel helpless and overwhelmed (“The situation is dire. What difference can I possibly make?”). Faith communities address helplessness in multiple ways, both directly and indirectly. For instance, gathering for worship can be understood as turning toward a Higher Power (God, divine Mystery, Creator, Source) in whose presence we are uplifted, and feel our strength renewed. Entrusting ourselves to God can release within us unexpected power “to accomplish abundantly far more than all we can ask or imagine” (Ephesians 3:20). A person of faith is someone who is committed to the search for truth. A Zen Buddhist might speak of facing reality as it is. A Jew, Muslim, or Christian might speak of relating to an all-seeing, all-knowing God who is truth and who leads us into all truth. At their best, the Abrahamic faiths believe that God has given us the capacity to learn about the created world through the lens of science. Science is one important avenue to discovering what is true. People of faith try to see through self-deception and illusion in their quest to discover what is true and to live their lives in accordance with the truth. Truth includes both material and spiritual realities. By definition, facts are true until proven otherwise. We do not have any right to our own facts. Science has established that climate change is real, largely caused by human activities, already inflicting widespread damage, and, unless humanity swiftly changes course, on track to make it difficult or impossible for civilization to continue to exist. We know that 80% of known fossil fuel reserves must stay in the ground, lest we plunge past the point of no return. We know we must make a just and swift transition to a clean energy economy. Such facts are difficult to face and absorb. But faith communities have the capacity to face facts, tell the truth, and dismiss denial. We trust, and are accountable to, a sacred reality that includes and transcends the material world. From this vantage point, faith communities are uniquely positioned to see through the lies of climate denial. Thanks to our commitment to the truth, we can let go the comfortable fibs and fantasies we may be tempted to tell ourselves (“I don’t need to change; I can continue with business as usual; climate change is someone else’s problem”). We also seek to uncover the confusion, misinformation, and lies about climate change that are deliberately spread by the fossil fuel industry and by the political leaders they fund. Not to do so is to participate in idolatry and to betray our own commitment to bear witness to the truth. As a Christian, I believe that a religion that directs our gaze to a suffering, dying man on a cross is a religion that can face painful facts. As a Christian, I also believe that perceiving God’s presence in the very midst of suffering and death is a gateway to transformation and new life. “Where there is no vision, the people perish” (Proverbs 29:18, KJV). Climate science has done its job, giving us essential facts about the potentially catastrophic consequences of continuing to burn fossil fuels. But facts alone are not sufficient to persuade people to take meaningful, concerted action. For that, we need vision – a shared goal, purpose, and values. This is what faith communities can do: lift up a vision of people living in just and loving relationships with each other and with the whole Creation, a vision energized by a deep desire for God’s love to be fully manifest in the world. Faith communities have a vital role to play in inspiring action to safeguard the world that God entrusted to our care. Human beings hope for so much: we want a good future for our kids; we want a livable world; we want the web of life to remain intact. The climate crisis challenges these cherished hopes. It renders uncertain the future of the whole human enterprise. Faith communities offer a context in which to explore and take hold of the kind of hope that does not depend on outward circumstances but that emerges from a deep and irrepressible place in the human spirit. Animated by a radical, God-given hope, people of faith throw themselves into healing the Earth and its communities, human and other than human. Active hope – actively embodying ones deepest values and being ready at every moment to welcome and build the longed-for future – is a path to joy. Climate change is a “threat multiplier” that exacerbates existing problems, such as poverty, hunger, terrorism, refugees on the move, and the spread of infectious diseases. Racism, militarism, and xenophobia – the fear of what is perceived to be foreign or strange – are likely to increase as the planet warms and as various groups battle over depleted resources, such as arable land and clean drinking water. Religious groups, like every other group, can be hijacked by fear and become sources of discord and violence. Yet the deep message of all the world’s religions is that we are interconnected with each other and with the Earth on which all life depends. Faith communities can help to restore our capacity to love God and our neighbor. The climate crisis is already bringing together leaders and members of many faiths in a unified call to protect Earth and all its inhabitants, human and other than human. Pope Francis’ landmark encyclical on climate justice, Laudato Si’, generated an ardent and enthusiastic response from diverse faith communities around the world. 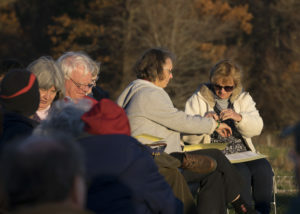 In a sermon, a D’var Torah, or a dharma talk, in prayer circles, worship services, and meditation groups, in pastoral care, outreach, and advocacy, faith communities can renew our intention and deepen our capacity to act in loving ways, to respect the dignity of every human being, and to cherish the sacredness of the natural world. Faith communities speak to the heart of what it means to be human. When people are going mad with hatred and fear, only love can restore us to sanity. The climate crisis raises existential questions about the meaning, purpose, and value of human life. What is our moral responsibility to future generations? What does it mean to be human, if human beings are destroying life as it has evolved on this planet? How do we address the anger, self-hatred and guilt that can arise with this awareness? How can we live a meaningful life when so much death surrounds us? How determined are we to radically amend our personal patterns of consumption and waste? What does living a “good” life look like today, given everything we know about the consequences of over-consumption, inequitable distribution of resources, and being part of (and probably benefiting from) an extractive economy that depends on fossil fuels and unlimited growth? Faith communities provide a context for wrestling with these questions, for seeking moral grounding, and for being reminded of such old-fashioned values as compassion, generosity, self-control, selfless service, simple living, sacrifice, sharing, justice, forgiveness, and non-violent engagement in societal transformation. I expect that this is true not only for Christians, but for people of every faith. The coal miner who just lost his job… the CEO of a fossil fuel company who is making plans to drill for more oil… the woman whose home was destroyed by Hurricane Sandy… the farmer watching in despair as his crops wither from a massive drought… the construction worker laying down pipeline for fracked gas… the activist arrested for stopping construction of that pipeline… these are just some of the people who probably have wildly divergent views about the climate crisis and who may feel harmed by and angry with each other. Faith communities can provide settings for difficult conversations, active listening, and “truth and reconciliation” groups modeled on the Truth and Reconciliation Commission that was formed in South Africa in the 1990’s after apartheid was abolished. By expressing compassion while also holding groups and individuals morally accountable, faith communities can create possibilities for reconciliation and collaboration that would otherwise never exist. What’s more, because of their historic commitment to the oppressed, marginalized, and poor, faith communities can give voice to the needs of people and all creatures who are generally ignored or exploited by the people in power. The climate crisis can make us go numb. Why think about the enormous stretches of coral reefs in Australia that just died in less than two months? What can we possibly feel in response to the acidifying ocean, the children choking from asthma in our inner cities, the rising seas, the ever-increasing droughts and floods, and the cascade of species going extinct? It is hard enough to face our own mortality or to mourn a loved one’s death. How do we begin to explore our fear and grief in response to the ecocide going on around us – much less express it? How do we move beyond despair? Faith communities can give us practices, teachings, and rituals that allow us to feel, express, accept, and integrate the painful emotions evoked by climate change. To ignite and sustain an emergency response, society needs to overcome what Salamon calls our “affect phobia,” our tendency to repress our feelings and to react to climate change only in terms of intellectual analysis and facts (How many heat records were broken last month? How many parts per million of CO2 are in the atmosphere now?). With the support of communities of faith, we can protect our human capacity to feel our emotional responses to the crisis without being overwhelmed by grief. Our emotions can also become a source of energy for constructive action to address the emergency. Faith communities can also provide comfort and solace day by day. We can develop networks of pastoral care and spiritual outreach to address the rising rates of depression, anxiety, and other psychological challenges that are associated with climate change, being mindful that low-income communities may be particularly vulnerable to climate-related stressors. Faith communities have a long history of leading movements for social and environmental justice, from child labor to women’s rights, peace, the abolition of slavery, and the civil rights movement. Faith communities tap into our capacity to dedicate ourselves to a cause that is greater than our personal comfort and self-interest. Faith in God (however we name that Higher Power) can inspire people to take bold actions that require courage, compassion, and creativity. Faith communities can model best practices for “going green,” such as to get an energy audit, increase energy conservation and efficiency, look into installing solar panels, put in bike racks, replace lawns with community gardens, and so on. But taking care of our immediate buildings and community is just a start. An adequate response to the scope and speed of the climate crisis requires collective action and political engagement. Because of the current gridlock in Congress, it can be tempting either to quit participating in democracy entirely or to stay engaged but demonize our opponents. 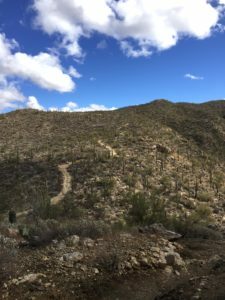 A recent blog post by my bishop, the Rt. Rev. Doug Fisher, persuasively contends that because Christianity is a “world-engaging faith,” people who follow Jesus must stay politically engaged and also encourage civil, non-partisan, political discourse that serves the common good. The climate emergency is propelling people of different faiths to organize and to lobby for strong legislative action. See, for instance, the national work of Citizens Climate Lobby to put a fair and rising price on carbon, whose volunteers include clergy and members of congregations, and the national work of Interfaith Power & Light, which has an affiliate here in Massachusetts. 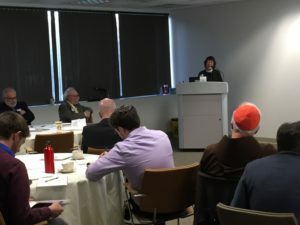 MA Interfaith Coalition for Climate Action, launched only months ago (full disclosure: I’m on the Leadership Team), is pressing for timely, high-impact changes in laws and systems in our Commonwealth. 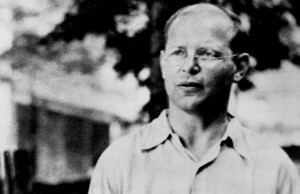 In the footsteps of trailblazers such as Gandhi and Martin Luther King, Jr., hundreds, maybe thousands, of people, including countless people of faith, have been arrested in recent years as non-violent resistance to fossil fuels continues to grow. 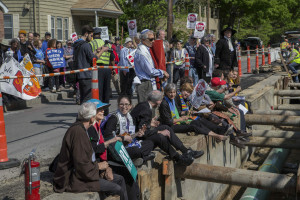 With fifteen other religious leaders, I was arrested on May 25 at a prayerful protest against construction of Spectra’s West Roxbury Lateral pipeline in Boston. 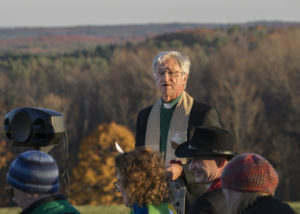 On June 29 twelve faith leaders – Buddhist, Jewish, Protestant, and Unitarian Universalist – were among 23 people arrested in another protest of the same pipeline. In solidarity with the hundreds of people who recently died from deadly heat waves in Pakistan and India and were buried in mass graves, the clergy led a climate ‘mass graves’ funeral, featuring eulogies, prayers, and mourning, with some of the resisters lying down in the grave/trench for nearly two hours. By inspiring significant action, such as divesting from fossil fuels and engaging in civil disobedience, faith communities can challenge the deathly status quo of “business as usual” and rouse society out of its apathy and inaction. 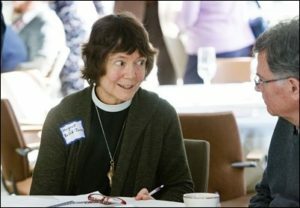 For religious leaders who want to network with colleagues to engage in visionary and prayerful civil disobedience, sign up at ClergyClimateAction.org. To join an epic march, July 14-18, against new gas pipelines that will go all the way to the Massachusetts State House, visit People Over Pipelines. II. When faith communities understand the climate crisis and enter emergency mode, what tools do we offer? The myths, tales, parables and stories of religious traditions give us powerful ways to re-imagine our selves and our situation, and to absorb deep (not necessarily literal) truths. Stories speak not just to our rational mind but also to our affections, will, and imagination. From the Judaeo-Christian tradition, stories of Moses confronting Pharaoh and of Jesus healing, teaching, suffering, dying, and rising again – all these and more can be brought to bear to address the climate crisis and to give us courage, guidance, and motivation to act. Recently I learned that activists fighting to stop construction of a trash-burning incinerator in a low-income neighborhood of Baltimore are using the story of Naboth’s vineyard (1 Kings 21:1-21a) to illuminate their own experience of social and environmental injustice and to inspire their own acts of resistance. 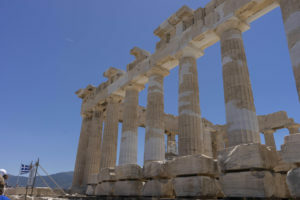 Every faith tradition offers practices that teach us how to move out our habitual narrow orbit of self-involvement and to connect with a larger, sacred reality. The climate crisis invites people who until now have felt immune from any desire to pray, to explore practices of prayer and meditation. Expressive forms of prayer empower us to move beyond denial and numbness and to acknowledge the full range of our feelings. My article, “Feeling and pain and prayer,” originally published in Review for Religious, presents four ways that Christians can pray with difficult feelings. 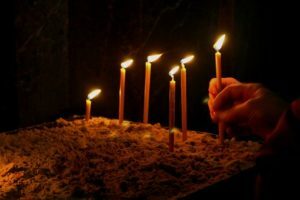 The article also describes how expressive prayer can change us over time, deepening our sense of intimacy with God, our experience of a peace that passes understanding, and our capacity to move from helplessness and hopelessness to effective action. Contemplative forms of prayer (such as Centering Prayer and mindfulness meditation) strengthen our capacity to sit in silence with the unknown, to accept impasse, and to keep listening and trusting even in the darkness. Practices that lead the mind into silent awareness offer more than a respite from thinking about the climate crisis. They can open us to an intuitive, non-verbal experience of communion, even union, with others, with the natural world, and with ultimate reality. Experiencing our unshakable union with a love that is stronger than death is the great gift of contemplative prayer. Rooted in that fierce and openhearted love, we are guided to actions commensurate with the emergency we’re in. Faith traditions offer a range of ceremonies and rituals that seek to awaken our awareness and revive our relationship with a sacred presence or power beyond the limited world of “I, me, and mine.” In a time of climate crisis, people need rituals that address our fear of death and give us courage to trust in a life greater than death. We need rituals that ask us to name our guilt and regrets, that grant us forgiveness, and that give us strength to set a new course. We need rituals that remind us of our essential connection with each other, with the rest of the created world, and with the unseen Source of all that is. We need rituals that remind us of how loved we are, how precious the world is, and what a privilege it is to be born in a time when our choices and actions make such a difference. 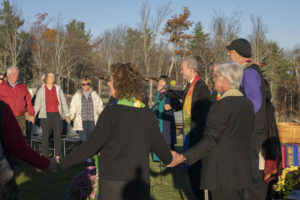 Faith communities have a heritage of holy days, festivals, days of atonement, and liturgical seasons that gain fresh meaning in light of the climate crisis. It takes courage to preach about climate change. If you’re a faith leader who speaks or preaches frequently about the climate emergency, then yours is a rare and much-needed voice. If you’re a member of a faith community whose leaders speak rarely, weakly, or never about climate justice, then please give them steady encouragement to say what needs to be said. As my climate activist friend and colleague, Rev. Dr. Jim Antal (Conference Minister and President, Massachusetts Conference, United Church of Christ) often says, if clergy don’t preach about climate change every few weeks, then in ten or fifteen years every sermon will be about grief. My own ongoing efforts to preach a Christian perspective on climate are here. 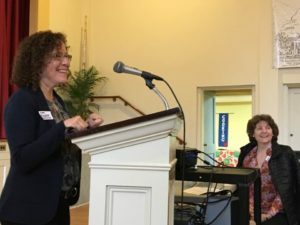 Last year’s “A New Awakening,” an ecumenical initiative to promote climate preaching across New England, has a Webpage of preaching resources. I just received a copy of Creation-Crisis Preaching, by Leah D. Schade, which looks like indispensable reading. 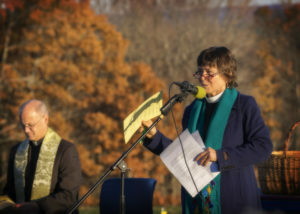 Over the years I’ve led or participated in many outdoor interfaith public liturgies about climate change. In the wake of environmental disasters such as the Gulf of Mexico oil spill or Typhoon Haiyan in the Philippines, or on the eve of significant environmental events, such as Pope Francis’ visit to Washington, D.C. or the U.N. climate talks in Paris, people of all faiths often feel a need to gather so that we can express our grief, name our hopes, and touch our deep longing for healing and reconciliation. Faith communities can lead the way in providing public contexts for renewing our spirits, both indoors and outside. III. What does this add up to? Faith communities can become agents of transformation. Humanity stands at a crossroads. As individuals and as a species we face a decision of ultimate importance both to our souls and to the future of life. “I have set before you life and death, blessings and curses. Choose life so that you and your descendants may live” (Deuteronomy 30:19). This is not a fire drill. This is an actual emergency. 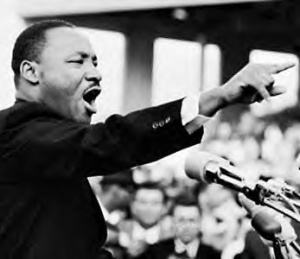 Martin Luther King, Jr. got it right: we face “the fierce urgency of now.” “See, now is the acceptable time; see, now is the day of salvation!” (2 Corinthians 6:2). Armed with this knowledge, faith communities can enter emergency mode. Speaking as a Christian, I envision a church in which every aspect of its life, from its preaching and worship services to its adult education and Sunday School, from its prayers to its public advocacy, grasps the urgency of protecting life as it has evolved on this planet. That is the kind of Church that the world needs today. I am thankful for all people who are willing to face squarely the most challenging, even devastating facts; who reach into their reserves of courage, faith, and hope; and who step out to bear witness in very tangible ways – even in the face of suffering and death – to the ongoing presence and power of a love that abides within us and that sustains the whole creation. You can download an article adapted from this blog post by clicking here: How can faith communities address the climate crisis? NOTE: I was prompted to write this essay after serving on a panel of faith leaders at the 2016 conference of Citizens Climate Lobby in Washington, DC. The panel’s moderator, Peterson Toscano, asked two questions: What role(s) do you see faith communities take on in times of crisis? What tools does your faith tradition offer that can be used to address climate change? The four panelists included Dr. Steven Colecchi (Director of the Office of International Justice and Peace, U.S. Conference of Catholic Bishops), Rachel Lamb (National Organizer and Spokesperson, Young Evangelicals for Climate Action), Joelle Novey (Director, Greater Washington Interfaith Power and Light), and me. The hour was over well before we’d finished exploring the topic. This essay is a bid to extend the conversation. What a blessing to be with you today! Thank you, Eliot, for welcoming me as preacher and celebrant for this special service that brings together the congregations of St. John’s Episcopal Church and First Congregational Church. As some of you know, I serve as Missioner for Creation Care in both the Episcopal Diocese of Western Massachusetts and the Massachusetts Conference of the UCC. This is my first opportunity to speak to my Episcopal and my UCC brothers and sisters in Christ at the very same time. How cool is that? It’s particularly meaningful that our two communities are united in worship this morning, because around the world people of many faiths are marking today, June 12, as a day to stand together and lift up the sacredness of the Earth, our common home. Prayers, blessings, songs, and sermons are being offered today from Alaska to Argentina, from New Jersey to New Zealand, as religious and spiritual groups far and wide mark a global day of prayer called Sacred Earth, Sacred Trust. Today we celebrate the six-month anniversary of the Paris Climate Agreement and the first anniversary of the publication of Pope Francis’ landmark encyclical, Laudato Si. Today we join the chorus of voices announcing that the Earth is holy and that it deserves our protection and care. Whenever you and I re-awaken to God’s presence in Ashfield’s hills and woods, in the grasses and dirt beneath our feet and in the stars overhead, we discover again that we are connected not only to other human beings but also to everything else. We are part of the web of life: connected by our breath, blood, flesh, and bone to the whole creation. As our Protestant forebear, Martin Luther, pointed out: “God writes the Gospel, not in the Bible alone, but also on trees, and the flowers and the clouds and stars.” God’s love and presence are everywhere – not just in church, not just inside a sanctuary built by human hands, but also outside, in the sea and sky, in the humble tomato plant valiantly trying to grow in my shady garden. The crucified, risen and ascended Christ fills all things, sustains all things, and redeems all things. I am blessed to worship with you this morning. Thank you, Cricket, for inviting me back to preach. The last time I was here, I served the Episcopal Diocese of Western Massachusetts as your Missioner for Creation Care, but since then my job has expanded: now I also serve as Missioner for Creation Care for the United Church of Christ in Massachusetts. As far as I know, I’m the only person who holds the same job in both the Episcopal and UCC Churches. To me, this joint position, is an emblem of good things to come. As we awaken to the climate crisis, Christians of every denomination – in fact, people of every faith – have a precious opportunity – even in the midst of our wonderful and colorful diversity – to pull together and to speak with one voice about the urgent need to safeguard the world that God entrusted to our care. Today’s Gospel text gives us a way to reflect on our call to protect and heal “this fragile Earth, our island home.” In a story from the Gospel of John, Jesus heals a paralyzed man whom he finds lying beside a pool. It is a quick little story – no more than nine sentences – so let’s pause to visualize the scene. The pool, called Beth-zatha, is located near one of the gates into Jerusalem. Years ago archaeologists actually located and excavated the pool. Apparently it was quite large and had four sides. Stairways were built in the corners of the pool, so that people could descend into the water, which may have been fed by springs that welled up at intervals. The bubbling waters were thought to have healing powers, and sick people – the blind, the lame, the paralyzed – came to the pool, believing that whenever the waters were stirred up, the first person to enter the pool would be cured of whatever sickness he or she had. That’s the scene. Here’s the story. A man who has been ill for thirty-eight years is lying near the pool on his mat. The story doesn’t say how long he has been waiting to get into the water, but it does say that he has been there “a long time” (John 5:6). What do you imagine this man is going through, as he lies paralyzed for so long beside the pool? As I imagine it, he feels helpless. The waters that can heal him are close by, but out of reach. What can heal him is way over there, separated from him, at some distance away, and he can’t move toward it. He can’t reach it. He can’t get there. He is cut off from the source of healing, and he is utterly paralyzed. What’s more, he is cut off from the people around him, too, as he competes with the crowd to be the first to get into the pool when the waters bubble up. 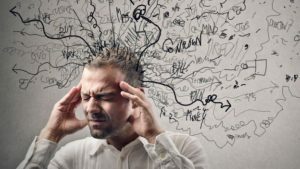 Who knows what he is feeling, but I would guess anxiety, frustration, desperation, even despair – all those painful, negative feelings that get stirred up when we feel helpless, vulnerable, and alone. Now of course we can take the story literally, as a story about physical illness, but in John’s Gospel every story has an imaginative or symbolic dimension, too. When I imagine my way into this story and hear it in the context of climate change, all kinds of connections start playing in my mind. I start thinking about the ways the world’s web of life needs healing – about the alarming levels of carbon dioxide now pouring into the global atmosphere as coal, gas, and oil continue to be burned, about the oceans heating up and becoming more acidic, about the rising seas that could flood, disrupt, and even take down our country’s coastal cities within the lifetime of our children. I think about the new report saying that continued burning of fossil fuels could cause great swaths of the Pacific Ocean to suffocate from lack of oxygen in only 15 years. I think about the 93% of coral reefs that just bleached in the Great Barrier Reef of Australia. March 2016 was the hottest month ever recorded, which crushed the record set in February, which crushed the record set in January, which crushed the record set in December. A recent article in the Washington Post bears the title, “Scientists Are Floored by What’s Happening in the Arctic Right Now.” When we hear news like this about our ailing planet, it’s easy to stop listening. It’s too much to take in, so we shut down. We may feel paralyzed by anxiety or paralyzed by grief. Like that man beside the Beth-zatha pool, we may feel immobilized and overwhelmed. How can this dire news be true, and how can we possibly respond? Where can we turn for help and healing when our planet is on track to catapult into climate chaos caused by an ever-expanding economic system that runs on fossil fuels? People the world over can become so gripped by fear, anger, and despair that they feel unable to imagine, much less create, a better future, so they just carry on with business as usual. It’s as if we can fall under a spell and make what U.N. Secretary General Ban-ki Moon calls a “global suicide pact.” So please turn with me again to our Gospel story. Jesus comes upon this scene of the blind, lame, and paralyzed beside the pool, and, the story tells us, “When Jesus saw [the man] lying there and knew that he had been there a long time, he said to him, ‘Do you want to be made well?’” (John 5:6). That single sentence says a lot. The first step in this miracle of healing is that Jesus saw the man and knew him. John’s Gospel underscores again and again that when Jesus sees us and knows us, he sees and knows us through and through, more widely and deeply than we know ourselves. He looks deeply into us with eyes of love, with eyes that see the whole truth of who we are, and that perceive everything in us, everything about us, with loving-kindness and compassion. When we open ourselves to Jesus or to our Creator God in prayer, we open ourselves to the One “unto whom all hearts are open, all desires known, and from whom no secrets are hid” (Collect for Purity). In prayer, we turn toward the Holy Presence who searches for truth deep within and whose loving embrace encompasses everything we are, everything we feel. That is the first step in today’s healing miracle: Jesus sees and knows. The second step in healing is his question, “Do you want to be made well?” That is a surprising question. We might have expected Jesus to take one look at the situation, pick up the man without a word, carry him straight to the pool of healing water, and slide him in. Why waste time? Why bother asking such an obvious question? When someone is hungry, you offer food to eat; when someone is thirty, you offer drink. Why mess around asking questions? But Jesus’ question reveals something important. The God we meet in Jesus does not force or push, even when it comes to healing. The God we meet in Jesus is deeply respectful of our freedom and gives us space in which to choose. It seems that in order for real healing to take place and new life to spring forth, God’s desire to heal us must meet our own desire to be healed. Do you want to be made well? It is not just a rhetorical question with a pro forma answer. The question invites the man paralyzed beside the pool to explore his desires and to clarify what he truly wants. Regarding the climate crisis, do I really want to be made well? Well, yes and no. Part of me prefers to stay blind, to close my eyes, duck my head, and turn my attention to more manageable things. Part of me prefers to come up with lame solutions: OK, I’ll change the light bulbs, but that’s it, I’ve done my part. Part of me feels paralyzed: I’m no expert; I’m too small to make a difference; surely someone else will take charge and figure this out. How does the man by the pool reply to Jesus? “‘Sir,’ [the man says,] ‘I have no one to put me into the pool when the water is stirred up; and while I am making my way, someone else steps down ahead of me’” (John 5:7). Jesus’ response is powerful and short: “‘Stand up, take your mat and walk.’ And at once the man was made well, and he took up his mat and began to walk” (John 5:8-9). What just happened? How did the healing miracle take place? I can’t explain it. But as I imagine it, as Jesus gazed on the man with those piercing, loving eyes that saw and knew and loved him through and through, and when Jesus asked him the probing question, “Do you want to be made well?,” in a flash of insight the man could admit his own halfheartedness and mixed motives and the ways he’d been holding back. I imagine that he felt his deep-down desire to be whole and free, his longing to love and be loved, his longing to draw close to God and to serve God “with gladness and singleness of heart.” So I imagine him claiming his deepest desire and turning to Jesus to say, “Yes, I want be fully alive. I want to fall in love with life, to give myself in love to each moment without holding anything back. I want God’s healing power to flow through me, so that I heal others and so that I, too, am healed.” The Gospel does not record that conversation, but I imagine it happening non-verbally by glance and gesture, as the sick man looked up at Jesus and said, without words, “Yes, I want to be made well.” “Stand up,” Jesus said, “and walk.” And he did. And so can we. Amazing things happen when we join our deep desire for healing with God’s deep desire to heal. When I look around, I see a planet in peril, but – thanks be to God! – I also see people shaking off their paralysis, reaching deep into their souls, and accessing their deep, God-given desire to love and serve life. I see people standing up to join the struggle to maintain a habitable planet and to create a just and sustainable future. I see a wave of religious protest and activism rising up around the world, as people refuse to settle for a killing status quo and declare that climate change is a spiritual and moral issue that must be tackled boldly and without delay. Just think of all the signs we see of a growing movement that is pushing for a new social order. We see people blocking the path of new fracked gas pipelines and being arrested for civil disobedience as they read aloud from Pope Francis’ encyclical. We see people lobbying for a fair price on carbon, so that we can build a clean green economy that provides decent jobs and improves public health. We see our own Episcopal Church deciding to divest from fossil fuels, since it makes no financial or moral sense to invest in companies that are ruining the planet. We see new coalitions being formed and new alliances being forged, as people realize that the environmental crisis is closely connected with the social crises of poverty, income inequality, and racial injustice. Right here in Massachusetts we have a strong grassroots climate action network, 350Mass for a Better Future, which has a node right here in the Berkshires. 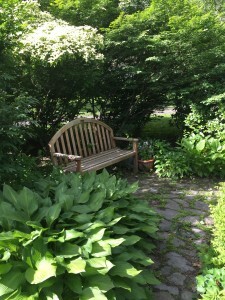 I’ve left a clipboard at the back of the church, and if you sign up for the weekly newsletter or attend a node meeting, you’ll connect with a vibrant local effort. I’m also part of a new group, Massachusetts Interfaith Coalition for Climate Action, or “MAICCA” for short, which is bringing together people of different religious traditions to advocate on Beacon Hill for legislation that supports climate justice. 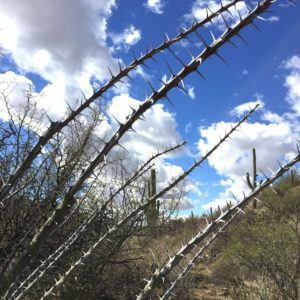 I hope you’ll sign up for MAICCA’s newsletter, too, for we are fighting to keep fossil fuels in the ground and to accelerate a transition to clean, safe, renewable sources of energy, such as sun and wind, that are accessible to all communities, including those that are low-income or historically underserved. As climate activist Bill McKibben points out, “The fight for a just world is the same as the fight for a livable one.” The Church was made for a time like this – a time when God calls human beings to know that we belong to one Earth, that we form one human family, and that God entrusted the Earth and all its residents to our care. One last word about our Gospel story: notice that the man didn’t need to be immersed in the pool of Beth-zatha in order to be healed. In Jesus’ presence, the man discovered that the healing spring was not outside him – it was inside him, just as it is inside us. As Jesus told the woman at the well (John 4:1-26), Jesus gives us water that becomes in us a “spring of water gushing up to eternal life” (John 4:14). Even in troubled and scary times, we have everything we need. The healing pool is within us; the spring of healing is already bubbling up; and Jesus will nourish us with his presence in the bread and wine of the Eucharist. In the strength of that bread and wine and through the power of the Spirit, we can be healed from paralysis and become healers and justice-makers in a world that is crying out for our care. 1. The Anchor Bible: The Gospel According to John (I-XII), introduction, translation, and notes by Raymond E. Brown, S.S., Garden City, NY: Doubleday & Company, Inc., 1966, pp. 206-207. It is good to be here at St. Paul’s and to worship with you this morning. 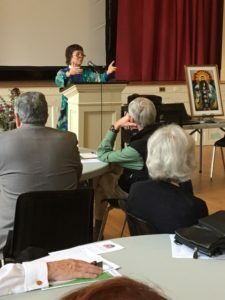 My name is Margaret Bullitt-Jonas and I have a quite unusual ecumenical position as Missioner for Creation Care in the Episcopal Diocese of Western Massachusetts and in the United Church of Christ across Massachusetts. I travel around, preaching and leading retreats about God’s love for this precious planet and its inhabitants, human and other-than-human. My dream is to help create a wave of religious activism to protect and heal the web of life that God entrusted to our care. So I want to thank you for your leadership. You’ve installed solar panels, you’ve formed a Green Team, some of you have read and studied Pope Francis’ landmark encyclical, Laudato Si’, and I’m told that many of you want to explore how to connect with nature as a spiritual practice. Preachers around the country are marking Earth Day today and speaking about the glory and the vulnerability of God’s Creation. How wonderful that our readings this morning include Psalm 148, that powerful song of praise to God from the heights and depths of creation, from every element and creature, from every nook and cranny: “Hallelujah! Praise the LORD from the heavens; praise God in the heights… Praise God, sun and moon; praise God, all you shining stars… Praise the LORD from the earth, you sea-monsters and all deeps; Fire and hail, snow and fog; tempestuous wind, doing God’s will; Mountains and all hills, fruit trees and all cedars…Young men and maidens, old and young together. Let them praise the Name of the LORD…” (Psalm 148:1,3,7-9,12,13) This kind of ecstatic poetry springs from a perception that everything is connected, everything is alive with Spirit, everything is held together by a divine presence that sustains and upholds all things. That’s the vision of St. Francis of Assisi, whose “Canticle of the Sun” proclaims: “Praise be my Lord for our brother the wind, and for air and cloud, calms and all weather, by which you uphold life in all creatures.” That’s the vision of poets like Gerard Manley Hopkins, who wrote, “The world is charged with the grandeur of God.” That’s the vision of theologians like Martin Luther, who said, “God writes the Gospel, not in the Bible alone, but also on trees, and the flowers and the clouds and stars.” That’s the vision, I believe, of Jesus himself, a man who lived close to the Earth, whose ministry began by immersion in a river and who prayed and lived and walked countless miles outdoors. In his parables and stories, Jesus talked about God in terms of natural things: seeds and sparrows, sheep and lilies, rivers, wind, and rocks. Jesus was immersed in the sacredness of the natural world and it’s no wonder that in our sacraments we, too, make contact with simple earthy things: with bread, wine, water, and oil. We trust that God is in these things – that when we take in the consecrated bread and wine of the Eucharist, we take in God’s presence. 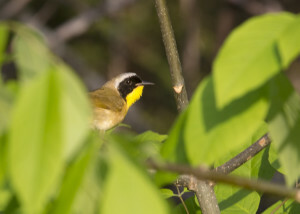 This powerful perception that the natural world is holy awakens in some of us a deep response. We want to ensure that God’s sacred creation is treated with reverence. We feel a growing resolve to take action to heal and reconcile and restore the beautiful world that God entrusted to our care. Heaven knows that God’s creation is crying out for help. The web of life is unraveling before our eyes. In just 200 years – a blink in geologic time – human beings have burned so much coal, gas, and oil and released so much heat-trapping carbon dioxide into the atmosphere that atmospheric levels of CO2 are higher than our species has ever experienced before. So far that extra CO2 has forced the average global temperature to rise about one degree. That may not sound like much, but what’s so worrisome to scientists is that this process is happening so fast. Already oceans are heating and becoming more acidic; tundra is thawing; ice caps are melting; sea levels are rising; coral reefs are dying; massive droughts are spreading in some places and heavy rains intensifying in others. We’re on the edge, or in the midst, of what some experts call the sixth major extinction event on this planet. March 2016 was the hottest month ever recorded, which crushed the record set in February, which crushed the record set in January, which crushed the record set in December. A recent article in the Washington Post bears the title, “Scientists Are Floored by What’s Happening in the Arctic Right Now.” We know that the situation is urgent. We know we have only a short time in which to avert a level of climate disruption that would render the world ungovernable and possibly uninhabitable within the lifetimes of our children and our children’s children. The World Bank – hardly a leftist organization – recently warned that unless we quickly rein in greenhouse gas emissions, climate change will drive 100 million people into extreme poverty – extreme poverty – in the next 15 years. Just imagine for a moment the human suffering and social upheaval that this would engender worldwide. When I look around, I see a planet in peril, but – thanks be to God! – I also see person after person reaching deep into their souls and then standing up to join the struggle to re-weave the fabric of life and create a just and sustainable future. 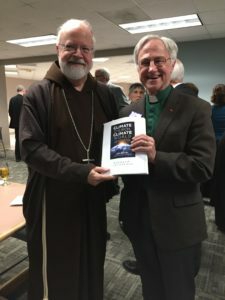 I see a wave of religious protest and activism rising up around the world, propelled in part by the release of Pope Francis’ Laudato Si’, which makes a powerful connection between the cry of the earth and the cry of the poor. I see people rising up for life, refusing to settle for a killing status quo, and proclaiming with one voice that climate change is a spiritual and moral issue that must be tackled without delay. Just think of all the signs we see of a new social order being born. We see people blocking the path of new fracked gas pipelines and being arrested for civil disobedience as they read aloud from Pope Francis’ encyclical. We see people lobbying for a fair price on carbon, so that we can build a clean green economy that provides decent jobs and improves public health. We see our own Episcopal Church deciding to divest from fossil fuels, since it makes no financial or moral sense to invest in companies that are ruining the planet. We see new coalitions being formed and new alliances being forged, as people realize that the environmental crisis is closely connected with the social crises of poverty, income inequality, and racial injustice. Right here in Massachusetts we have a strong grassroots climate action network, 350Mass for a Better Future, which has nodes across the state. When you sign up for the weekly newsletter or attend a node meeting near you, you’ll be hooked into a vibrant local effort. I’m also part of a new group, Massachusetts Interfaith Coalition for Climate Action, or “MAICCA” for short, which is bringing together Christians, Jews, Quakers, Unitarians, and people of all religious traditions to push for legislation that supports climate justice. Together we are fighting to keep fossil fuels in the ground and to accelerate a transition to clean, safe, renewable sources of energy, such as sun and wind, that are accessible to all our communities, including those that are low-income or historically under-served. 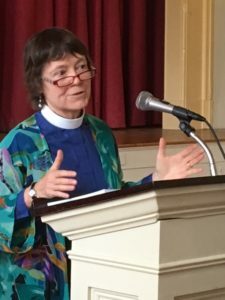 As climate activist Bill McKibben has pointed out, “The fight for a just world is the same as the fight for a livable one.” The Church was made for a time like this – a time when God calls human beings to know that we belong to one Earth, that we form one human family, and that God entrusted the Earth and all its residents to our care. We may live in a society where we’re told that pleasure lies in being self-centered consumers who grab and hoard everything we can for ourselves and the devil take the hindmost, but we know the truth: our deepest identity and joy is found in being rooted and grounded in love and in serving the common good. As Jesus tells us this morning, “By this everyone will know that you are my disciples, if you have love for one another” (John 13:35). 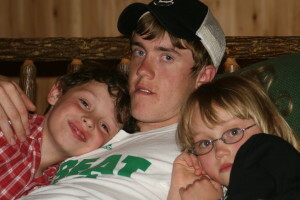 That love extends not only to our own little group nor only to our family and friends. It extends not only to our town, to our nation, nor only even to other human beings – no, that love extends outward to embrace and fill the whole glorious creation, including mountains and hills, trees and beetles and stars. God has placed us in and made us part of a miraculous, intricate, and living world, and when we listen closely we will hear what the psalmist hears: a shared song of praise to our Creator. I’ll close with the words of a contemporary song that echoes Psalm 148. Written by Kim Oler, the song (“Blue Green Hills of Earth”) is part of Paul Winter’s “Missa Gaia.” I offer these words to God as a prayer – a prayer of gratitude for the gift of life, and a prayer of hope that we can protect that life and pass it on to future generations. For the earth forever turning; for the skies, for every sea; to our Lord we sing, returning home to our blue green hills of Earth. For the mountains, hills, and pastures in their silent majesty; for all life, for all nature, sing we our joyful praise to Thee. For the sun, for rain and thunder, for the land that makes us free; for the stars, for all the heavens, sing we our joyful praise to Thee.